This new plate is stamped from original dies with no excess holes. The modern point sub assembly and condenser incorporates fixed pivot pin location for proper cam and rotor contact relations and reproducible point assembly replacement. It also features tungsten contact points and condenser constructed of modern materials and sealed against moisture for long life. The use of modern and standard components make replacement parts available at virtually any automotive parts supplier. The condenser has been relocated to shield it from engine heat effects. The package also features a 0.020 plastic feeler gauge for easy point adjustment, correct plating, and instructions for adjustment and use. This is the finest and most popular modern upper plate available. 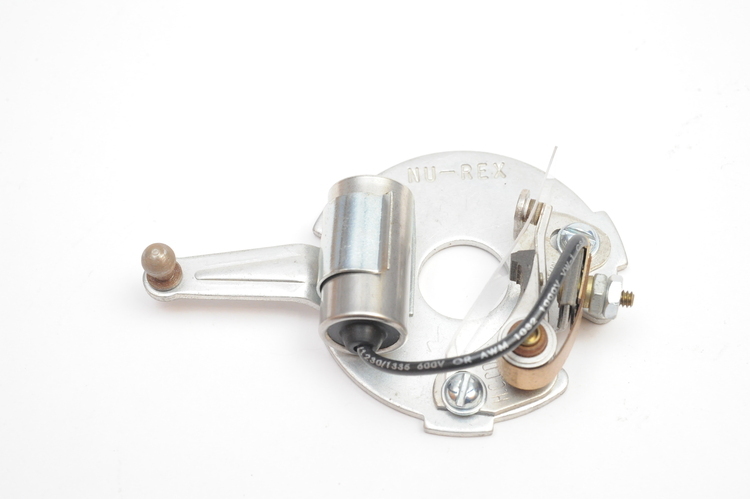 This is a genuine Nu-Rex part. © 2019 Nu-Rex. All rights reserved.